The S+ is a sleep monitor that promises to analyse and improve your bed time. While pretty much every fitness tracker claims to help you make more sense of your snoozing, this device has been built by ResMed, a US company that was working in sleep decades before anyone was talking about Fitbit. ResMed sells the gold standard piece of equipment in the treatment of sleep apnea and, fresh from over 25 years of success in that field, it's dreamt up a piece of smart kit to help people with all aspects of shut-eye. While some sleep trackers sit on your wrist and others clip devices to your pillow, S+ by ResMed doesn't even need to touch you at all. It just watches. It's the world's first contactless sleep tracker. So what's it like to sleep beside the S+? We've been letting it watch over us for a few weeks now to see what it's made of. The S+ is quite big and borderline ugly. That's the very worst thing about it. It's effectively a rectangular prism shape made up of a stand and an upper section where all the hardware is housed. It sits on your bedside table taking up far too much room, not looking that great and getting in the way of your glass of water, phone, watch and anything else that you normally reach for while you're in bed. It needs to be close by so that it can watch you move. In that sense it's a bit of a pest, but if you can rearrange your space accordingly, then you'll find it's a worthy addition to your bedroom. The S+'s main competitor, the Withings Aura, has been rather clever about being even bigger and uglier by taking over the functions of some of your bedside objects such as your radio and your light. That would be well worth considering for ResMed in the next generation. On the plus side, S+ makes up for hogging one of your power points with an adaptor that has two USB ports – one for itself and the other, most likely, for your phone. Lastly, it's worth noting that S+ isn't a piece of cake to set up. There's nothing that complicated about it, but getting the positioning right so that it can read your sleep well takes a little trial and error. Pro tip: it's worth spending a little time on this for the best results. On top of the straight light sleep/heavy sleep/REM sleep measurements that most trackers feature, the S+ has a few very effective extras. It's designed to analyse your entire sleep routine and that includes what you do during the day. When you hit the sleep button on the mobile app, you'll get presented with a questionnaire about what you've been up to: how much caffeine you've had, how many alcoholic drinks, whether life's been stressful and if you've managed to do any exercise. The idea is that you can then view the sleep data with respect to all these other variables to see if there's any meaningful correlation. If you're willing to genuinely use these features, there's a heap of benefits, but if you're the type of person who's going to get bored within a week, think carefully before you buy. Once you've filled that in – it takes a matter of seconds – you're ready to head off to the land of nod. This is the clever part. S+ uses what is effectively sonar to watch your breathing patterns and, from that, it can tell what kind of sleep stage you're experiencing and when it changes. Technically, it should be a very tricky thing to work out REM compared to deep sleep without a measure of heart rate or an EEG, but accuracy seems to be one of S+'s strong suits. Obviously, it's impossible to tell for sure unless you're at a sleep lab in a hospital but it always picked up on those moments when we woke in the night straight after a dream. It's perhaps a shade off what the Withings Aura can do but it's easily good enough for home use. It's also possible for your significant bed-sharing other to use your S+, but not at the same time. They'll need an app and account of their own and once those are set up you can switch simply by who happens to be Bluetooth connected to it at any one time. Of course, whomever is being monitored will need the S+ on their bedside within an easy arm's reach otherwise it's not going to work. If it were any longer range than that, then there would be issues of the unit getting bodies confused during monitoring which, we're glad to report, was never the case. So, the bottom line here is, yes, you can have two people using the same S+ but not concurrently. The S+ has a bag of other sensors inside as well, and their job is to measure your sleep environment. The big issues there are light, sound and temperature and, again, much like the variables of the sleep questionnaire, all that data gets bundled into the platform behind it for more a holistic sleep analysis. 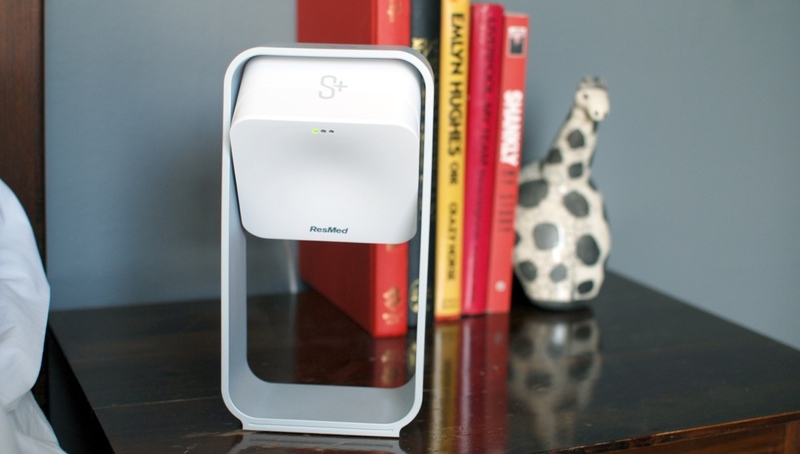 Naturally, S+ also has a smart alarm system that will wake you up when it decides it's a good moment to do so. You choose your ideal time and then give it a window of between 15-30 minutes before in which it can take matters into its own hands. It's hard to say whether it worked or not because, frankly, we feel like crap at whatever time we're woken in the morning. Ultimately, it's a better idea to sleep as much as you can but, if you're really terrified of sleep inertia – the technical term for feeling horrible in the morning – well, you might get some use out of this. What we loved, though, was the mini-stress relieving feature called Mind Clear. Just before you pop off, you can hit the Mind Clear button and either write down or voice record whatever's been bothering you. The idea is that getting it off your chest and into the real world is often enough to take some of that bad feeling away. Given that an anxious mind is the least compatible state with getting to sleep, it's not a bad idea. Lastly, like all the best sleep trackers, S+ features a bank of sleep sounds which will, apparently, get you in the mood for a good kip. We liked the ones that it had, but we want to see more than nine to choose from, particularly as there are only two natural sounds in that list. What's unique about the sleep sounds in this device is that the system matches the tempo of the music to your breathing patterns. As you begin to drop off, the sounds slow down and supposedly sends you into a deeper and better quality sleep. It's rather hard to quantify whether or not that really worked as we were asleep at the time but what we will say is that we liked the system and always dropped off nicely when we used it. So perhaps the proof is in the pudding there. The only part we really had an issue with is that the sounds have to come through the paltry speaker in your mobile phone because there isn't one built into the S+ itself, although any Bluetooth speaker will solve that issue. This is where the S+ really excels. The S+ is far and away the most involved, most in-depth and probably most life-changing sleep device we've ever worked with. It has much more data to play with any other, thanks to that pre-sleep questionnaire as well as all of those environmental recordings. You can sift through all of that manually on your computer using the S+ web app if you choose. It's actually quite fun. You'll quickly get an idea of say, the effect of caffeine on your REM sleep or stress on your deep sleep, which can all make for habit-changing material. Better still, though – because, of course, not everyone has the time or the inclination for such stuff – the coaching system, S+ Mentor, can do the job for you and then send you little push notifications about how to correct things. So, for example, it picked up pretty quickly that we weren't getting enough REM sleep and then proceeded to tell us how to improve to a point where we had it nailed and, as it goes, we feel a lot better for it. On one particularly impressive occasion it spotted that we'd been out on a bender and gave us tips on how to best catch up the next night. In a world where wearables are struggling to make meaningful inferences, S+ Mentor is gold dust. Beyond all that, the S+ mobile app is pretty good. There's some decent graphical analysis and even a section dedicated to daytime napping, but it would be nice to have everything that's on the web app available on your phone too. It’s a touch short on sleep features compared to the Withings Aura and it’s a bit of a pain to have next to your bed, but there’s no denying that the S+ by ResMed has the biggest potential out of all such devices to make a measurable difference to the quality of your sleep. Stick with it, follow its advice and we’d wager that anyone without a serious, physiological sleep issue will start to reap the benefits of a better rested body and mind. all this mention of tracking sleep, but the bottom line is that it does nothing to prevent it. also there are 2 types of apnea. one is OSA or obstructive sleep apnea. this is where the throat closes and your airway is obstructed or closed lacking oxygen. the other is a failure of brain signal issue. totally different issue. you can track your sleep to the moon and back, and like me, I have apnea, and the cpap machine doesn't work for me. (50 percent of apnea patients cant use cpap) so I'm sure I would see alarms going off on all this monitoring stuff, but at this time, the last fix is either a surgeon opening up your throat, or implanting a stimulator device in your chest. my insurance company refuses to allow the implant because its considered experimental. yet its been out for 5 years. the medical field sits on their hands while people are dying from this issue. I get up like I've only slept 4 hours, and feel like collapsing working in a factory 40 hours a week. there is help available, but the part of the medical field that makes money off of people being ill calls the shots, and you can call on the phone, and they will just say sorry, we don't care if you die... so sad..